The weekly podcast charting the latest in pop culture news is joyful, witty and compelling. Entertainment 18 January, 2019 . Written by Sarah McKenna Barry. Conor Behan and Holly Shortall’s podcast Popsessed is seven episodes in, and the duo has already garnered a cult following, rave reviews and a sweet spot on the Irish podcast charts. The weekly podcast sees Shortall and Behan – who charts the songs we love so well in GCN’s music column – deep dive into the latest pop culture news, gossip and memes. The duo rifts seamlessly off each other for the most part, coming together to share what’s on their radar each week. Shortall’s ‘deserved x’ and ‘not deserved x’ section is a mainstay of the podcast in which she sorts the week’s top stories into their corresponding categories. Popsessed reaches its weekly climax when the team reveal which celebrity has warranted the ‘Neeeeck of the Week’ award. In short, the podcast – which is produced by their sister show Exposé and Virgin Media Television – is queer culture. Ultimately, Conor and Holly perform a very important public service with Popsessed. At the start of Episode 5 – ‘Bloggers Unveiled, the Kardashians and the Neck of THE YEAR’ – Conor proclaims “We are popsessed with saving the world!”, and he is not entirely wrong. Whether they are campaigning for Nadine Coyle’s ‘Go To Work’ to get the chart treatment it deserved – can you believe this banger has less than 500,000 views on YouTube? – or laying into Kendall Jenner for her ‘brave, coming out story’ – she used to have acne – there’s no denying that Popsessed is unafraid to tackle the serious issues. It’s Holly and Conor’s natural chemistry that makes Popsessed the cult fave it has become. 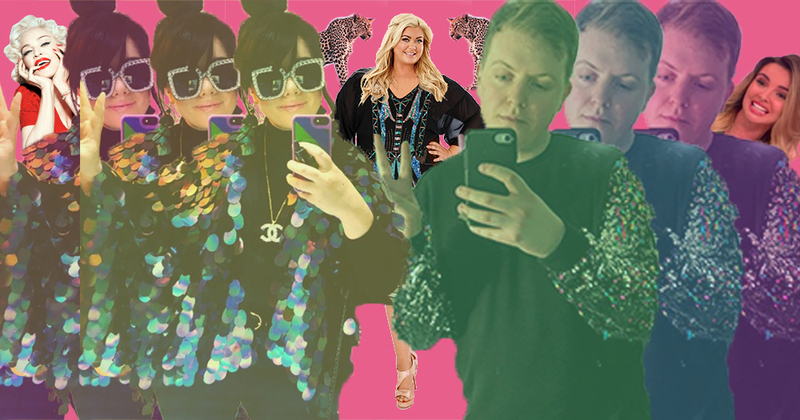 Their undying love for Ariana Grande, Dublin’s drag queens, Samantha Mumba, leopard print, and the ultimate queer icon, Gemma Collins is instantly relatable to their following. Additionally, Holly and Conor continuously interact with their listeners on Twitter, showing humbleness, an impressive feat given that Holly herself has become something of a local celebrity on the Manchester LGBT+ scene. Subscribe to Popsessed wherever you get your podcasts and follow Holly on twitter @hollyshortall and Conor at @platinumjones. 18 January, 2019 . Written by Sarah McKenna Barry.